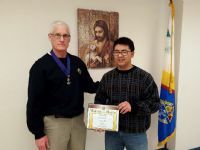 GK Rudolph presented Inside Guard LonGiang Le with Knight of the Month for January 2019. 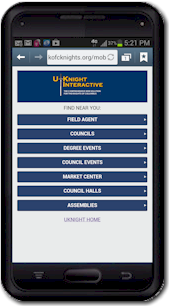 Rudolph made special recognition of Le's willingness to volunteer for just about every Knight activity since joining the Council, in addition to chairing the annual free throw contest and soccer challenge. 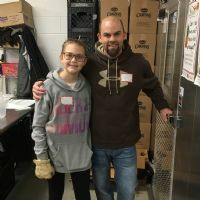 December 2018 Knight of the Month awarded to Council Chancellor Sam Phillippe, pictured here volunteering at the Marie Wilkinson Food Pantry with his daughter Katie. As Grand Knight presented the March 2018 Knight of the Month award to Ramon Rivera, he had these words to say: Ramon has lived up to the goal of giving ones time and talent. He has participated in many of the Knights events; Leaf Raking, Marie Wilkinson Food Pantry, Christmas Breakfast, ID Drive, and for over 10 years he has sung in the ensemble at 10:30 Mass. Thank you Ramon for all your time and work. 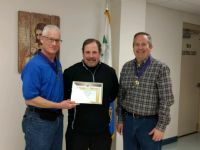 GK Mark Rudolph delivered these words while presenting to Gerard Tobin: At this time I have the honor of presenting the Knight of the Month Award to Brother Gerard Tobin. Gerard has been coaching basketball here at St. Joe's for over 15 years. Gerard has not only taught these young athletes how to improve their basketball skills he has also taught them to be better Christians. He has had the team members help with setting up tables and chairs for our different functions and in the fall they helped us with leaf raking. Gerard has taught these young men our Knights credo of service to family, neighbor, and church. Thank You Brother Gerard Tobin. Awarded to Sergio Uribes for his dedication and consistently agreeing to help out whenever called upon.